I talk about what’s bothering me. I tell my husband, I mention it to my kids, and I call my girlfriends to tell them about it too. Then I call my mom. Then I tell my poor husband about it again. Sometimes I just feel the need to vent, you know what I mean? When I’m worried, I fret aloud without realizing it. If my husband’s concerned about a decision, he asks one friend for advice. When I have an important decision, I ask ten people for their opinion. I process things verbally. I reduce my stress level by giving voice to my thoughts. But I’m learning I need to be careful. ​My words influence the atmosphere of my marriage and home. ​When I read this verse, I thought, “Unwholesome talk means profanity, right? Of course I don’t use vulgar language.” However, a bit of study revealed interesting synonyms for “unwholesome talk”: rotten words, foul, worthless, harmful, or polluting language. Can you imagine rotten words spewing out of someone’s mouth, polluting the atmosphere around them? Not very appealing, is it? ​If I’m not careful, I can pollute the atmosphere around me with rotten words. Many things we say each day without thinking can poison the atmosphere or cause a complaining, critical spirit to grow in someone else’s heart. I’m learning that I don’t have to speak everything I’m thinking. 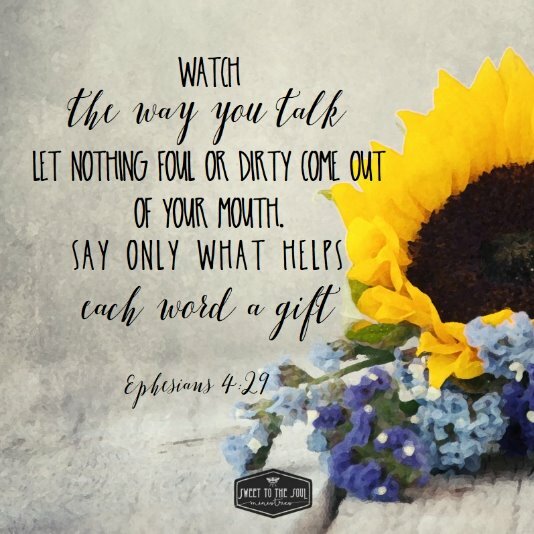 ​Today’s verse gives me 3 questions that help me think before speaking. ​Will what I’m about to say contribute to a peaceful, cheerful atmosphere at home or at work? Do others need to hear this right now? Will my words help or hinder? ​Does it build others up? ​Will my words encourage my family members or co-workers? Will they speak life? Will this meet a need or help anyone grow stronger? Will my words build the listener up or bring him down? ​Does it benefit my hearers? ​Will what I’m about to say bless or give grace to listeners in any way? Will my words be a gift that encourages someone or a burden that weighs him down? ​“Watch the way you talk. Let nothing foul or dirty come out of your mouth. Say only what helps, each word a gift." How about making an effort today to think before you speak? Maybe someone in your life needs affirmation, encouragement, compassion, or hope. Make your words a gift. Let’s impart grace by speaking words that are helpful, uplifting, and beneficial. ​Recently I wrote how I want to be a Fresh Water Woman who speaks life rather than a Salt Water Woman who spews out negativity. 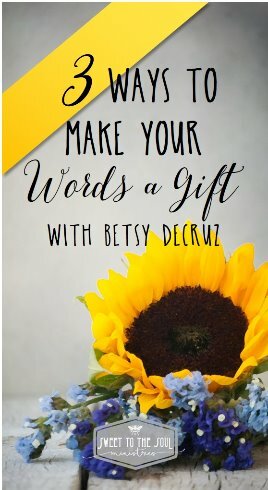 Betsy, I love the idea of every word being a gift. If I think of my words in that way, I'll focus more on how what I say will bless others (and hold back the words that don't). Too many times I allow my words to just spill out without thinking, or worse because I feel they need to be said for my own satisfaction. Thanks for encouraging me to pause before I speak. Happy Easter to you and your family, my friend. Happy Easter to you too, dear Marva! I know what you mean about letting those words spill out! I'm writing to myself, friend! I'm with you Betsy! In the boat! I'm a talker and my hubby sounds like yours. God keeps telling me to listen so I'm trying! %uD83D%uDE09 I love your list that goes beyond swear words. Complaining, fretful words....ouch. I'm a talker myself, Jodie. Saying a prayer for both of us now. Like our Good Book says, "Where words abound, sin is not absent." (My paraphrase.) Happy Easter to you, friend. sound, practical advice. Good questions to ask ourselves when we are "fretting" about things. I like your phrase: "I can pollute the atmosphere around me with rotten words." So true! 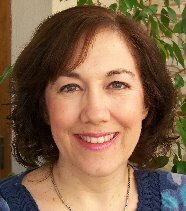 May the Lord make your words a gift to those around you today, Gail. Thanks for visiting here today. Such sage advice, such God-offered wisdom. Thanks for sharing your encouragement, Betsy. Thank you, Kristi, for reading today. You are a blessing, friend. Such great advice, Betsy. And timely for me. God keeps reminding me to let my words be few. (His filtering advice for my tendency to talk unhindered.) Blessings to you, sweet friend! You and me both, Sabra! This is a hard area for me, but I'm asking God to help me grow!